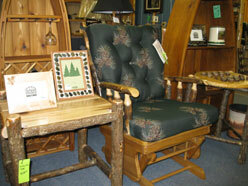 Welcome to Utke's Country Pine Furnishings situated amongst the beautiful pine trees in rural Park Rapids, Minnesota. 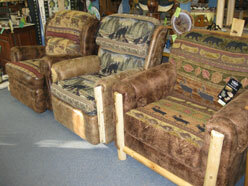 Traditional and log furniture, as well as lodge decor, fill our store. We also stock switch plates, artwork, Big Sky bears, bathroom accessories, northwoods comforters, pine shelves, coatracks, lodge signs and more. 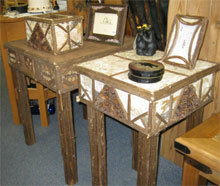 Our website shows just a small sampling of our furniture, gifts and accessories. We do offer delivery in the Park Rapids area; however, since we do not ship our furniture, we encourage you to come visit our store. You'll enjoy looking at the wonderful quality and selection as you browse our very unique store. Jan. - April: Open by appointment. Mid-September through Christmas: Friday & Saturday 10 a.m. - 4 p.m. & also by appointment.